The Nina T was an old fishing trawler crumbling away at the dock before being selected to join the Chester Poling just outside of Gloucester Harbor. The sinking was part of an artificial reef project. 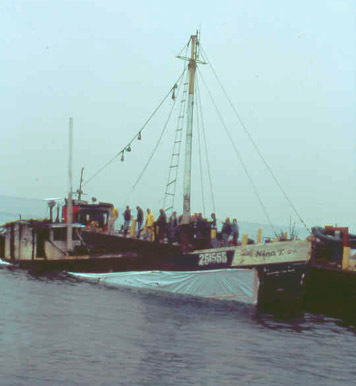 The wreck was wrapped in Tyvex plastic wrapping and dragged out a short distance away from the Poling’s stern section. The wreck was flooded and scuttled. She settled upright but listing to starboard. The wreck has become a popular second dive to the Poling and is often referred to as a “classic New England shipwreck” with her tall wooden masts stretching up towards the surface in an impressive sight. Time has not been kind to the Nina T however. The Nina T is now a jumbled debris field, having fully collapsed somewhere around 2003-2004. Still, the Nina T offers something for all divers. The conditions are similar to those on the Poling. Swimming off the wreck there is interesting debris and small artifacts of various kinds for the sharp eye. The wreck is small and the sand off the wreck is alluring. It’s good to run a reel unless the visibility is very good, as the wreck is small and hard to relocate once out of sight. Currents can become strong with tide changes. There is not much in the way of hang-ups, except for on the starboard side in the aft area where there is some line and net. The wreck has a max depth of 105 ft. This this is an advanced open water dive but like the Poling, divers of all levels and interests can enjoy this wreck well.